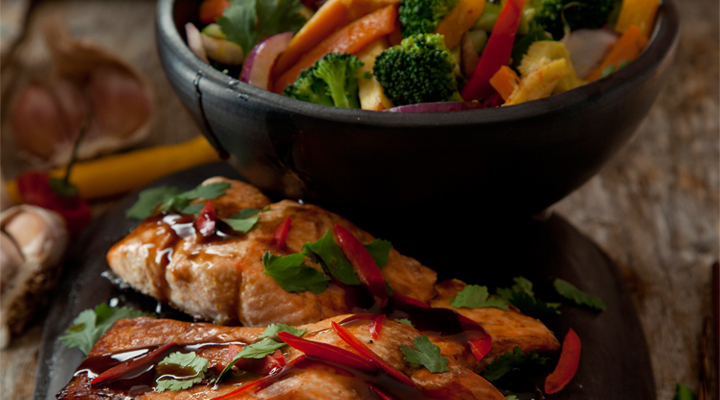 This homemade teriyaki sauce gives the salmon a sweet and salty flavour. Spread all the chopped vegetables on a baking tray. Drizzle with the olive oil, season with salt and pepper and roast for 30 minutes. While they roast, make the teriyaki sauce. Heat the olive oil in a pan set over a medium-high heat and fry the garlic, chilli and ginger for 3 minutes. Add the lime zest and juice, soy sauce and honey and cook for a few minutes more, until the sauce is reduced and sticky. Meanwhile, sear the salmon in a hot griddle pan for 2 minutes on each side. When the sauce has reduced, place the salmon in a baking dish and pour the teriyaki sauce on top. Cook in the oven for 15 minutes. Serve the salmon and the vegetables with some of the teriyaki sauce spooned over and garnish with fresh chopped coriander.